One of the many speakers at the recent Forbes' 30 Under 30 Summit was none other than Boston Celtics superstar point guard Kyrie Irving. Naturally, one of the questions that was posed to Irving was regarding previous comments about the roundness -- or lack thereof -- of planet Earth. It's been well-documented that Kyrie's stance on the issue has been muddy. That’s what I’m asking you. No, no, no. Can you openly admit that you know the Earth is constitutionally round? Like, you know that for sure? Like, I don’t know. I was never trying to convince anyone that the world is flat. I’m not being an advocate for the world being completely flat. No, I don’t know. I really don’t. It’s fun to think about though. It’s fun to have that conversation. It is absolutely fun because people get so agitated and mad. Many an eyebrow were raised after those comments, to say the least. Personally, I always felt Kyrie was messing with us. Did he really believe that? Was he just trying to see how far he could push the media? Or was he a full-fledged conspiracy theorist? Turns out, he was somewhere in between. While Kyrie essentially put this baby to sleep, he did have a few other eye-opening remarks. 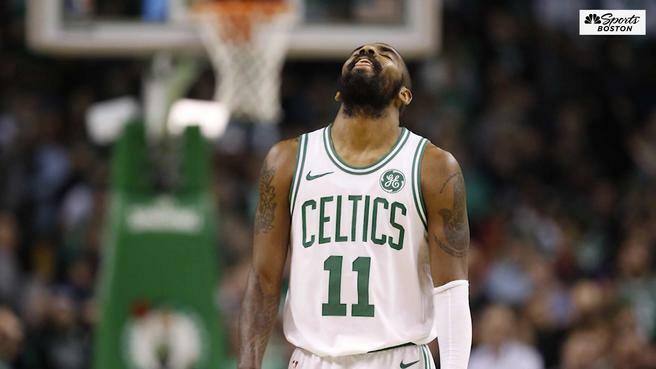 Kyrie on the playing for the #Celtics this season: “This is probably one of the few times I’ve been happy playing basketball and being in Boston has made it a lot easier, having a great environment, great organization so it’s been awesome." One of the few times he's been happy playing ball? Now, as a Celtics fan, I'm excited that he's happy rocking the parquet with the good guys, but it does raise the notion: how can one of the league's best, a man who is as one with the basketball as Mozart was with a piano, not have enjoyed playing ball? Especially when you consider he made one of the biggest shots in NBA Finals history, icing Game 7 and the 2016 NBA Championship on Golden State's home floor. Well, it makes sense if you think about it. He balled out in high school, then got hurt early in his college career. He was drafted by the Cavs (bummer again) and had to try and make the most of a dysfunctional situation and organization. Just as he was getting his bearings, Lebron James decided to come back, stealing his thunder. Then, he got hurt again. Now, a bit older and wiser, Kyrie's a free man. He's the leader of his own squad -- a member of the greatest basketball franchise on Earth, working with a savant for a coach, a genius for a GM, a roster as deep as the Pacific. All in the greatest sports city of all time. All we, as fans, need to know is Kyrie is more than happy as a Celtic. He's talked about having his #11 in the rafters, after all. But will we see much of Kyrie once he's hung 'em up? Likely not. I applaud Kyrie for wanting to disappear into the sunset, telling tech to take a hike as he goes dark during his later years. I just hope he helps raise Banner 18 before he does.